1. An assured Free Flipkart e-Gift Voucher worth Rs. 500 for the first 2,000 eligible reviewers. 2. Philips Air Fryers worth Rs. 14,995 Or Philips LED Living Colors lamps worth Rs. 11,499 for 10 lucky winners. NOTE: Philips Products Review Rewards offer is valid till 29th Dec 2013. 3. Navigate through the categories to select a product for review. Write the Review and Submit it. Philips India Limited is a subsidiary of the Netherlands-based Royal Philips. It is the leading Health and Wellbeing company. Philips is a simpler and more focused company with global leadership positions in key markets. These markets are Healthcare, Lighting and Consumer Lifestyle. Philips provides Philips Products Review Rewards to its customers for writing products review. Philips is a part of practically every Indian’s life. Philips stands as a source of easy to use, trendy and innovative internationally acclaimed products. The company has an excellent pan India distribution and after-sales service network. The company has an excellent pan India distribution and after-sales service network. Philips provides advanced energy-efficient solutions for all segments like office, industrial, hospitality and home. The Consumer Lifestyle arm operates in areas of Home Entertainment solutions and Personal Infotainment with various product categories. Such as TVs, home theatre systems, music systems, DVD players, personal entertainment solutions, sound accessories, Domestic Appliances and Personal care. 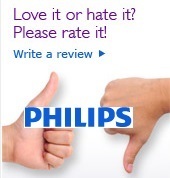 So use the Philips products and Enjoy Philips Products Review Rewards for writing their reviews.